Istina – Preokret, originally uploaded by bill kralovec. 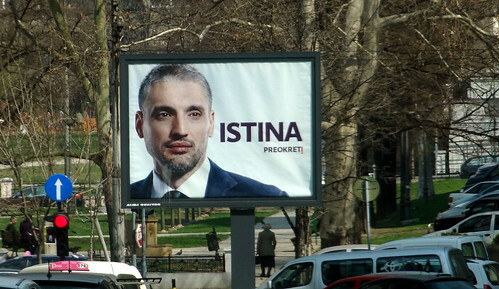 Thanks to the political campaign billboard above, I learned the word, “istina” means truth in Serbian. The good-looking fellow in the photo is Čedomir Jovanović, the leader of the Liberal Democratic Party (LDP). They are running for parliament in this spring’s elections. In reading a bit of background on Jovanović, the LDP is a minor party, and he finished in fifth place in the 2008 Serbian Presidential elections. Jovanović came to fame in the university student protests in the 1990’s, and served in the government of the late Prime Minister, Zoran Đinđić. He fell out of favor in the party, ultimately leaving current Serbian President, Boris Tadić’s party to form his own. In the little reading I did on him, he seems to make provocative statements in the press to seek attention. He especially went after the Serbian tycoons and the organized crime surrounding the Milosević regime. He favors the independence of Kosovo, integration with Europe and severing ties with the Republika Srpska. My advice for him would be to establish a career in a chosen field (university professor), and gain some experience outside politics before coming back and trying again. As with US politicians, his model-like looks help, but he is struggling to even get into parliament. .
Well he may look model-like to you in that poster, but the very dark circles under his eyes were obviously covered with make-up and/or removed with airbrushing/photo-shopping. And his teeth are real crooked and jumbled – you can see this on some google image searches. Cedomir Jovanovic is an idiot. There is no denying that. However, what is really sad is that in the years to come it is his family which will suffer the indignity of his ugly and selfish ways. A real man always will stop and reassess if what he is doing will ultimately bring shame and ill repute to his family long after he has left this world. Cedomir Jovanovic is not a real man. He is a selfish, self serving, opportunist who is using the existing dire economic situation in Serbia to create noise. I cant imagine why no one asks him how the Greeks, Hungarians, Bulgarians, etc have fared in the EU. Then he should explain how it would be different with Serbia.